Before you create articles in Ashes of Creation Wiki, we ask you to please read our style guidelines. Using the correct formatting and layout will make the wiki easier to understand and to maintain for everyone. 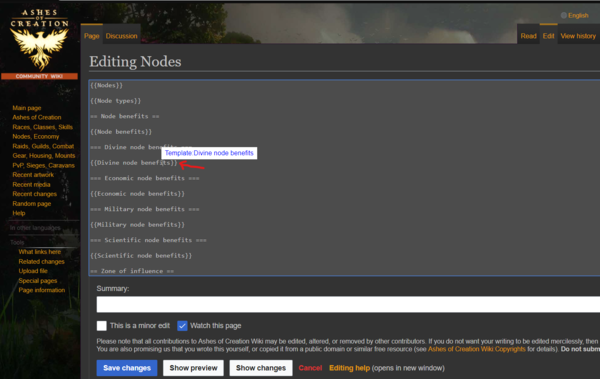 Ashes of Creation Wiki uses templates to house small blocks of information. These templates are assembled in the content pages to form articles. To edit a template, edit the article page, then scroll to the bottom. Click on "Templates used on this page" to reveal the list of templates, then choose (Edit) to edit that template. Editing templates is the same as editing a regular article. Before you save a change, you can enter a short note in the "Summary" box describing your changes. Don't worry too much about this, or spend too much time thinking about it: just put in a short description of what you just changed. For example, you might say "fixed typo" or "added more information about sunflowers". It's a good idea to use the "Show preview" button to see what your changes will look like before you save them. This isn't something to worry about too much, but it's good to get into the habit of eliminating mistakes in your own work by using a preview before saving, rather than saving then having to do another edit just to make one or more minor corrections. See Help_talk:Editing_pages for an example.